JACKSONVILLE, Fla. — Josh Scobee watched the highlight video from a leather chair in the front row of Jacksonville's team meeting room, grinning ear to ear with every kick, every call and every celebration. "That was great stuff," he said. 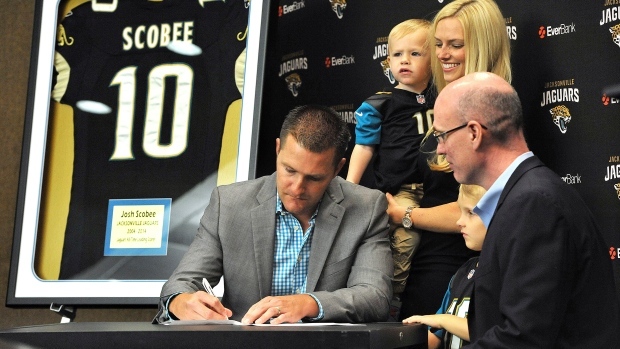 The 34-year-old Scobee signed a one-day, ceremonial contract with the Jaguars on Thursday and formally retired with the team that drafted him in 2004. Scobee called it quits after a dozen NFL seasons, including the first 11 in Jacksonville, and walked away as the franchise's all-time leading scorer. He sat next to his wife, their two young boys, his mom, in-laws and former teammates as his career accomplishments were shown on a big screen. His 59-yard field goal that beat AFC South rival Indianapolis in 2010 drew the loudest reaction. "I can recall every one of those kicks," Scobee said. "That's the fun part about it. I can recall the hash, the distance, the day, the temperature, the wind. It's fun to see that type of video." Scobee made 241 of 301 (80.1 per cent) field goals, with most of his misses coming from beyond 40 yards, and finished his career with 1,046 points. His 1,022 points with Jacksonville are the most in team history. Because of his tenure, his work in the community and his social-media presence, Scobee was one of the most popular players in franchise history. Linebacker Paul Posluszny, defensive end Jason Babin, linebacker Kyle Bosworth and punter Adam Podlesh were among former teammates on hand for his retirement ceremony. Scobee still lives in Jacksonville and has agreed to become a team ambassador, a job that includes attending games and meeting with fans. The avid golfer also hopes to work with the PGA Tour, which is based in nearby Ponte Vedra Beach. "When I first got into the NFL, I heard from a great special teams coach that the highest compliment that you can give someone in the NFL is to call them a true professional," Posluszny said. "Not that they were a great athlete or had great hands or was a great tackler. It was that you were a true professional. That meant that not only you mastered your skills and the position you played, you were dedicated, you were loyal, you were a great teammate and you did everything the right way at all times. When I think I of Josh, that's what he is. He's a true professional." Jaguars general manager Dave Caldwell traded Scobee to Pittsburgh days before the 2015 season, after rookie Jason Myers won the job in training camp. Scobee missed four field goals with the Steelers and was released after four games. He spent two months with New Orleans last year before getting released again. "The hardest part was not being involved with the Jaguars," Scobee said. "I was involved here for so long, did way more things than just play football. It was tough watching the games on TV. I still rooted for them, the team, as hard as I could. "Now that I have some closure, it's good to finally be done and do something else."